This is one of those plants that really needs no introduction because if you are a resident of Austin Texas, or the Austin Metro area, you have seen this jewel of a plant. With its striking good looks and fantastic flower display, it is one that has surely caught your eye on your journey through town. I love this plant for a number of reasons and if it is one you have used in your landscape, you already know why. 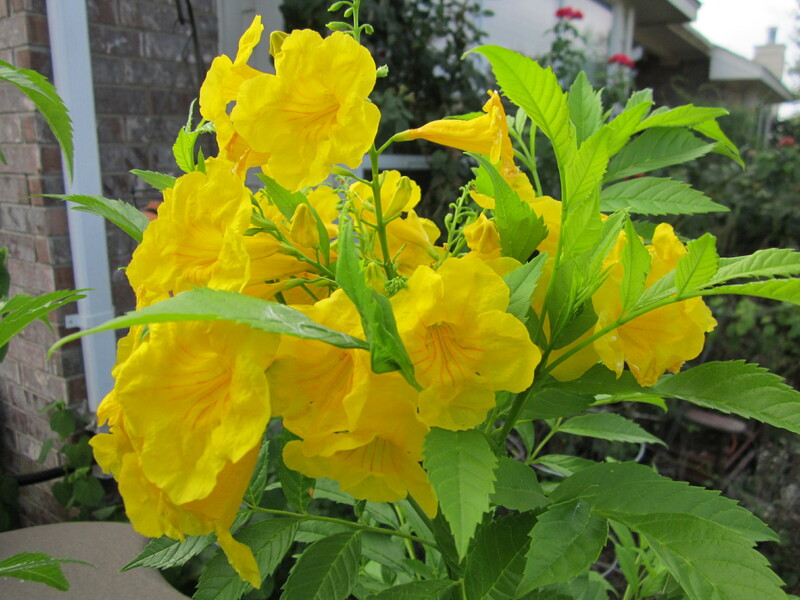 Considered a “Texas Super Star” this full Sun, delightfully adapted perennial plant sports some fantastic trumpet-shaped, bright yellow flowers with unusual glossy Green leaves that are serrated at the margin. It is a large plant reaching to heights of over 8′ (don’t believe the books, I have seen it with my own eyes!) and a sprawl of 4-6′. The odd thing about this plant is that it really can go in all directions if it is so inclined and some stay more compacted. Basically it is not a very uniform plant and pretty much goes where ever it wants direction-ally and as far as I am concerned, it is very welcome to do so. I consider this plant to be an awesome specimen plant, great as a deciduous (goes to sleep in the Winter) hedge, or planted in mass for a huge impact of color. The blooms have a slight fragrance and display a show of continuous blooms from Spring until the first hard freeze. It makes a quick comeback and is considered a semi-evergreen in area’s further South. The Esperanza is a truly drought tolerant plant with little to no maintenance in the blooming season. The only maintenance I might suggest is to cut back its over sized seed pods to make room for more blooms and to keep the limbs from hanging low from the burden of the weight, if so desired. I also suggest on just about all of your perennials that you do not cut your plants back after the Winter until early Spring or until you see some new growth. Cutting plants back too soon can mean you have left them exposed to a late season frost , or that you might be cutting off limbs that would come back if allowed too. As with all plants in your landscape, make sure to allow plenty of room for your plants to grow to maturity. Over crowding promotes disease, requires unnecessary trimming to maintain proper spacing and leads to the possibility of unnatural growth habits. By allowing your plants the space and light they require, your garden will reward you greatly for your efforts. Now, Go get your garden on! ← Crepe Myrtles with Aphids? It’s a “Sticky Situation”. Thank you Lisa for all your landscaping advise for those of us who don’t know what to do with our gardens! I think I will plant one of those in my garden now thanks to your inspiration and education. You are so welcome! I love talking about plants, I could do it all day and usually do! Lisa, I have a situation that is driving me crazy today. I am a little brokenhearted because this morning I saw my neighbor cutting back another neighbor’s Esperanza. It was about 5ft tall, blooming beautifully. The owner of the Esperanza bush lost her husband recently and he’s the one who planted it. I came home for lunch and noticed it was completely chopped off, no blooms, no nothing. Do u think it will come back?? I’m so worried. This morning I was in such a rush that I didn’t bother asking, I thought maybe she was just trimming it back. I feel sick. Help!! Hi Brenda, that is sad that is was blooming and would have until the freeze. The good news is that it is a perennial plant and will return in the spring ready to bloom again. So not to worry. In the future it is preferable not to cut them back until after ge winter months. Sorry for her loss, hope the neighbor was trying to be helpful.